Keep the memories of an important occasion close to you forever with a Date Pendant from Sorella. A wonderful way to celebrate an engagement, birthday, graduation or any day of special significance, Sorella Date Pendants make welcome gifts or a fitting reward for your own accomplishments. 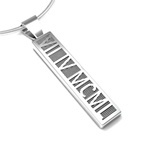 The design element of Roman Numerals lets you keep the meaning secret or share it as you choose. Sorella makes it easy for you to design a Roman Numeral Pendant that is like no other. Simply choose the precious metal you want – platinum, 14k or 18k gold (yellow, white or rose), palladium or sterling silver. If you like the look of a two-tone piece, you may combine the metals. For a little touch of romance, add a diamond or the birthstone of your choice. We’ll create the perfect piece to match your preferences.